Kevin Spacey, Heather Graham, Camilla Belle, Johnny Knoxville, Craig Robinson, and Virginia Madsen all star in the upcoming flick, Father of Invention. This cast is phenomenal! 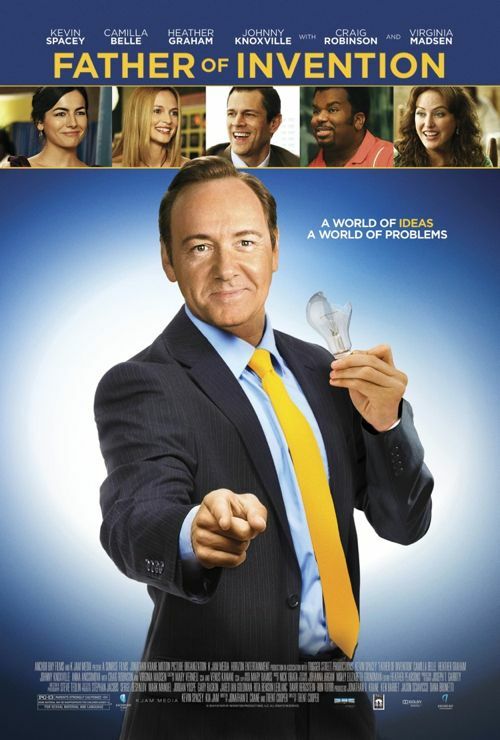 Millionaire infomercial guru, Robert Axle (Kevin Spacey) loses everything when one of his inventions has a design flaw that accidentally chops off the fingers of thousands of customers. After serving eight years in prison, a disgraced Axle is released, and ready to redeem his name and rebuild his empire with a new innovation. However, Axle’s ex-wife (Virginia Madsen) has spent all of his money and moved into his house with her new husband (Craig Robinson). Out of desperation, he finds a part-time job as a janitor, and is forced to move in with his estranged daughter (Camilla Belle) and her over-protective roommates. Despite these setbacks he is determined to pitch his newest gadget and rebuild his infomercial empire. But the world has changed in the last decade, and Axle finds himself out of step with current technology, his family, and the self-confidence that made him king of the infomercials in the past. With all his wheels spinning, Axle soon realizes before he can be successful with his new creation, first he must reinvent himself. Father of Invention hits theaters on October 14th.